It’s that time again. You know, the time of year where the kids go back to school after you have just finished recovering from some much-needed time off. But parents, step parents, foster parents and even grandparents know it won’t be long before their next break. Before we know it, winter will bid us a chilly goodbye and spring will make her debut. With that of course, comes the task of deciding what to do for spring break. While I’m almost always excited for a stay-cation, sometimes everyone—parents and kids—need a getaway. But it isn’t always easy finding options that work for everyone in the family. So here are six spring break vacations that are perfect for you and the kids. A nice road trip away from most southern states, Pigeon Forge and Gatlinburg are like a “two for one” vacation deal. 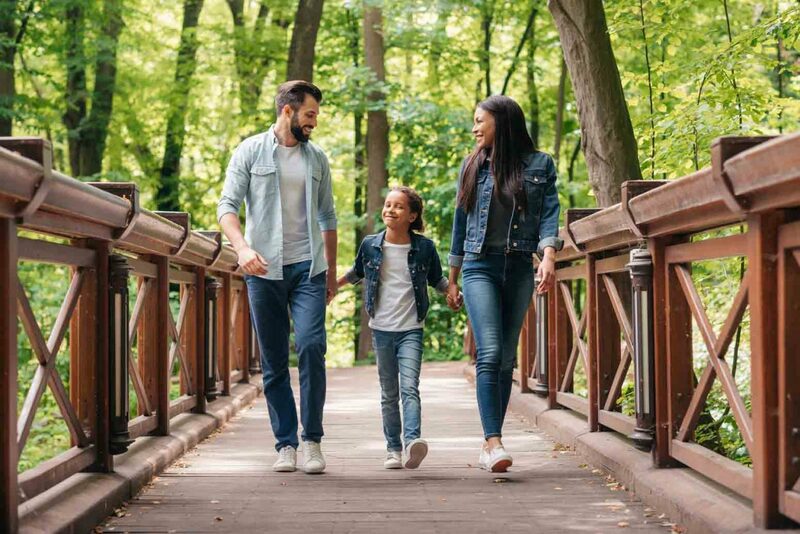 The two cities, both of which are mountain towns, lie only minutes away from each other and have a plethora of things to do for the entire family. Children of all ages will be easily wooed by Dollywood, Dolly Parton’s famous amusement park. The Island, a playful entertainment complex known for its retail shops, world class fudge, arcade, and rides has something for every member of the family. There’s even a hotel on site to make the stay more convenient. History buffs will appreciate the interactive Titanic and Alcatraz Museums, while adults looking for a nice, romantic date can head on over to Gatlinburg’s Space Needle, take a scenic helicopter ride, visit the spa, or even drive through Cades Cove for an unforgettable view of the Smoky Mountains. On top of all this, nature lovers can hike the Smoky Mountains or golf, while those who love to laugh can head on over to one of the cities’ comedy barns. Cabins are readily available and there’s even a biblical dinner show, at the Biblical Times Dinner Theater, to bring the entire family together. These two cities have it all, and I for one can attest to the fun my family and I have had there year after year. Known and loved for its amazing weather and proximity to the ocean, San Diego is a prime location for spring break fun. Home to the San Diego Zoo, the Fleet Science Center, Legoland, San Diego Air & Space Museum, Knott’s Berry Farm, and La Jolla Kayak, there are plenty of options to keep the kids busy. But don’t fret. The city has just as many options for adults. In addition to sunrise or sunset walks along the beach, adults can experience some Italian vibes with the Gondola Company, or immerse themselves in Victorian architecture at the Gaslamp Quarter. Exploring Balboa Park and Coronado Island, along with enjoying one of San Diego’s Harbor Cruises, are said to be once in a lifetime experiences. Before we know it, winter will bid us a chilly goodbye and spring will make her debut. So here are 6 spring break vacations that are perfect for you and the kids. I know, I know. Washington D.C. is probably not the kind of place that comes to mind when you think of spring break, but I assure you it’s worth considering. Perhaps one of the best things about visiting D.C. in the spring is the amount of free activities. With the gorgeous National Cherry Blossom Festival in full bloom, a simple stroll through Tidal Basin becomes magical. The Anacostia River Festival and jitney ride from D.C.’s Wharf to Hains Point in East Potomac Park are free as well. Young adults will enjoy the Wharf’s Recreation Pier, while adults and history lovers will enjoy the National Mall and Monuments by Moonlight tour. The International Spy Museum is another popular attraction. Street performances, the D.C. Ducks tour, Filmfest D.C., waterfront restaurants, and Passport D.C. make Washington D.C. a cultural trip that provides a different but exciting spring break experience. For those living in warm weather climates, Colorado Springs might just be the break you need. The weather is different and the city is full of fun things to do for the entire family. In addition to the Cheyenne Mountain Zoo, kids will enjoy CityRock camps, the Space Foundation Discovery Center, Penny Arcade, and the Dinosaur Resource Center. Couples looking for a nice night out on the town can expect a lovely time at Mona Lisa Fondue Restaurant, or take a short drive to a nearby town to experience some of Colorado’s best hot springs. Nature lovers will love exploring The Garden of the Gods and Red Rock Canyon, while adventure-loving teenagers will love the many zip-line courses that the city offers. If you haven’t experienced it already, The Ark Encounter is a wonderful place to take the family. Not only does the 510-foot-long and 85-foot-wide ark offer three different art exhibits, but it has its own zoo and zip-line obstacle course as well. Interactive, artistic, and based on truth, it’s a great opportunity for the entire family to learn historical facts while having fun. Larger groups can even spend the night in the ark while smaller groups can head on over to the Creation Museum for more fun, including a planetarium. Perfectly situated in Williamstown, Kentucky, the Ark Encounter is just a road trip away from Lexington, Kentucky, and Cincinnati, Ohio, which could add to even more spring break fun like the Great Wolf Lodge or the Newport Aquarium. So take a moment to refresh your own faith and then head on over to Lexington for some relaxing spa treatments and horseback riding, or to Cincinnati for the Ohio Caverns and some Lazer Kraze fun, which the kids will enjoy too. Last, but certainly not least, is San Antonio, Texas. This loving and creative city is bursting with tons of fun. A nice treat for you and the kids is the Stars and Stripes Drive-In Theatre, which has a playground for the kids as well. Seaworld San Antonio, Aquatica, Splashtown, and Six Flags Fiesta are some other family-friendly options. Who says you can’t embrace your inner child and hop on a roller coaster or two? But if you’re lucky enough to sneak away without the kids, San Antonio is a lovely place to relax, rejuvenate, and unwind. Out of Keller Williams’ twelve unique date ideas, which you can review here, relaxing in the Cuban inspired Ocho Lounge and listening to some smooth jazz at Jazz TX are my favorites. Spring break will be here before we know it, so why not try something new this year? Why not make spring break a break for everyone in the family? You need a break too. So do yourself a favor. Even if none of the places I’ve listed fit your fancy, determine to find a vacation spot that’s perfect for you, your spouse, and your kids. Your family will thank you. Besides, healthy and well-rested parents raise healthy, well-balanced children—and that, dear friends, is a wonderful world. Sharita is an introvert highly addicted to earl grey tea and essential oils. Though struck with the wanderlust gene, she's also prone to travel adventures off the beaten path.